The tenth highest score of June is equal to the third highest score of May! 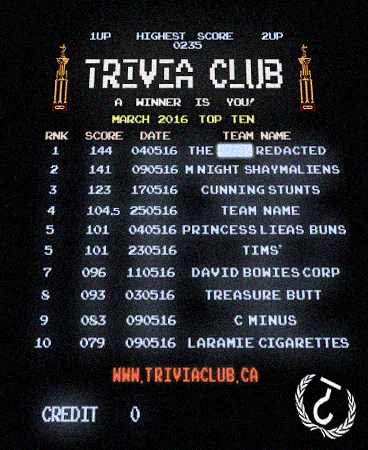 Every month is different at Trivia Club, but what's the same is the fact that every spot in the Top Ten is taken up by a different team! 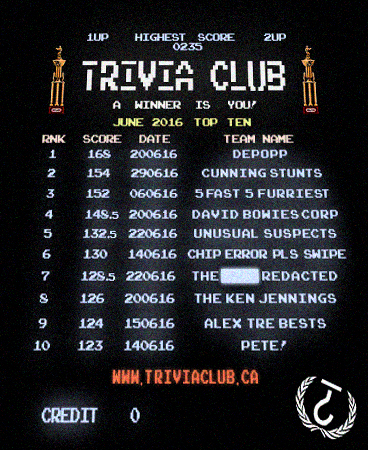 Cunning Stunts made another appearance on the list, however, with the highest score of the month for Cardinal Rule, winning with 154 points on the last Trivia Club of the month on June 29th. David Bowie's Corporate Whores also made a consecutive appearance on the Scoreboard, as did The |||||| Redacted! The top score of the month, and the highest score at Hitch for the month of June belongs to new-ish team, DePopp, with 168 points on June 20th! The 148.5 from David Bowie's Corporate Whores (as Sergeant Bowie's Lonely Whores Club Band) on the same night, is also the highest score from a team that did not win on the night! Chip Error, Please Swipe (also known as Lt. Dance) take home the Top Score at Lou Dawg's for the month of June, with 130 points on the 14th! Teams from Lou Dawg's only take up two spots on the Top Ten, with both scores coming on the 14th of June. Hitch and Cardinal Rule both have four teams a piece. The highest score night, on the Top Ten, is the June 20th edition of Trivia Club at Hitch, with the 1st, 4th, and 8th spot in the Top Ten putting up points on the night. PETE! had the tenth highest score of June, and he also had the eleventh highest AND twelfth highest scores as well, with his 115 points being the top score out of the Top Ten, and also the highest score out of the Top Ten belonging to a Golden VHS winner in June! Our Mean Team of June are The Unusual Suspects! Their 132.5 points is closest to the Scoreboard average. After taking four spots in the Top Ten of April, and the Top THREE spots alone, our reigning Golden VCR Grand Champions David Bowie's Corporate Whores, slowed down to a more tenable single spot, their Golden VHS winning April 11th appearance good enough for seventh on the Monthly Scoreboard. It's a diverse mix this May, with not one team making multiple appearances. The ||||||| Redacted take the top spot on the list, while also nailing down the top score at Cardinal Rule for the month of May, with 144 points on May the 4th! The M. Night Shaym-Aliens, proving why they're Trivia Club's most traveled team, take the top score at Hitch in May, with 141 points on the 9th of May. May 9th also makes the most appearances on the list, putting three teams into the Monthly Scoreboard, with the second place spot for the Shaym-Aliens, along with the ninth and tenth. The Cunning Stunts round out the top three with Lou Dawg's top score for the month, with 123 points on May 17th. Cardinal Rule teams make four appearances on this list, while Hitch also has four teams, and Lou Dawg's brings two teams forward, both of whom won the Golden VHS on the night. The highest score NOT to make the Top Ten and good for eleventh on the month, is a surprisingly low (in terms of recent trends, that is) 59 points from newcomers at Hitch, DXVD! The highest score from a team that didn't win the Golden VHS, is the 101 points belonging to Princess Leia's Buns of Steels, on May the 4th (naturally)! The highest scoring team from April not to make the Scoreboard in May, are the team otherwise known as Lt. Dance! They did however win the final Golden VHS of May. Our Mean Team of May are Team Name! Their 104 points is closest to the Scoreboard average! * Tim's full name was... "Tim's Tear Jerking Testimonial To Take To Task Tiny Tyrants"! And now you known why we just have "TIMS" in the image above.